Here you’ll find answers to some of our most frequently asked questions! What do you offer classes in? We offer classes in the following skills: aerial silks, aerial hoop (lyra), static trapeze, flexibility and contortion, hand balancing (handstands), partner acrobatics, tumbling, aerial sling (hammock), cirque conditioning, fire spinning, Corde Lisse, Chinese Pole, Spanish web, and more. We do not necessarily offer all classes all the time. Our Fire Arts classes for example, are only offered in warmer months. Right now Air Temple is open five days a week: Sunday – Thursday, though that sometimes changes session to session. We have many classes a week to choose from, so take a look at our calendar to see when each class is. You can also see our class offerings on our Registration Site. We generally run our classes in 8 week sessions and each session starts on a certain date, so we have winter session, spring session, etc. much like an academic calendar. Another similarity to the academic world is that when you sign up for a class (ie: silks 101 on tuesdays at 4:00), you are signing up to come to that specific class every Tuesday at 4:00 for the duration of the session. Why do you run classes like that? The reason for this 8 week structure is that unlike other disciplines like yoga, for example, is that each week we are learning something new and building off what we’ve learned in the previous weeks. Many people choose to do circus or aerial work because it’s a fun work out (and it is, trust us!) but it’s also an art form so we teach it as such. How much is a session of classes? A session of 8 classes is $216 which includes sales tax. If you are brand new to aerials you should sign up for a 100 level class or Aerial Fundamentals. If you have some experience but are new to Air Temple, contact the studio! I’m new to aerials but I have a dance/gymnastics/etc. background. What level should I sign up for? You should still sign up for level 101. Your athletic background will certainly help you advance more quickly, but aerial work is complicated and learning is sequential. You may be strong enough for level 200 when you start, but you’ll be at a loss if you don’t know the skills from the previous levels. I’m not sure I can make every class in the session, should I still sign up? Absolutely! When you sign up for a session of classes, you will have two ‘make-up’ classes that you can use if you cannot make it to class. Check out our studio policies for more info on make up classes. If you know you will need to miss more than two classes but still want to sign up for the session, please contact the studio! 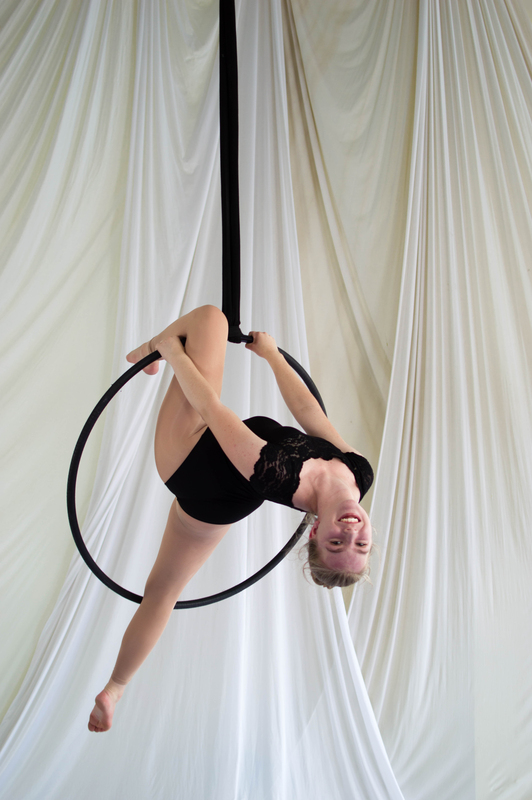 If you’re brand new to aerials/circus and choosing to do drop ins, you MUST come to the first class of the session, and should you choose to continue coming, cannot skip more than two weeks in a row. If you have experience and want to do drop ins, please contact the studio first so that we can make sure you’re coming to the correct class. We do this because learning is cumulative. We don’t want drop in students to get behind because it makes class more frustrating for everyone if someone come for the first time in the middle of the session. I just found your studio and I really want to sign up but it’s the middle of the session, can I? Unfortunately no, if you want to sign up for session classes you will have to wait for our next session to begin. However if you really can’t wait you’re more than welcome to schedule a private lesson in the discipline of your choice! I’m worried I’m to weak to do circus. Help? Don’t worry! All of our beginner classes operate under the assumption that the last time you did anything physical was the Presidential Fitness Challenge in high school. And no, you don’t need to be able to do a pull up! We do have certain strength criteria for advancement though, and you may have to spend more than one session in a level, which is not uncommon. We do! We offer more advanced students the chance to perform in our Open Stage Nights, which happen every few months. For more general questions about beginning aerial training, check out our Beginner Aerial FAQ!